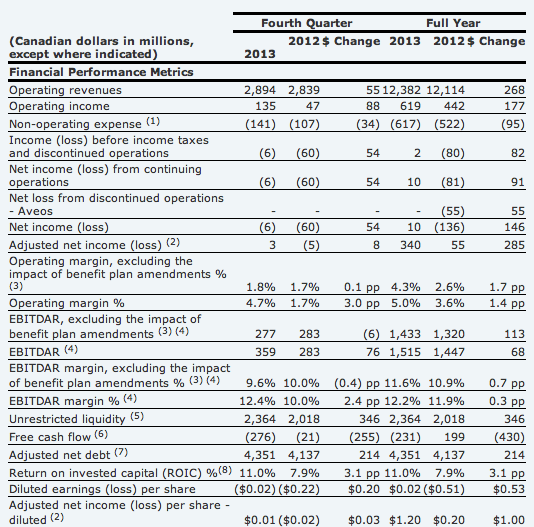 Air Canada’s decent FY2013 financial results are being overshadowed by a weakened 4Q2013 performance partly triggered by currency and weather headwinds that are carrying over into 1Q2014. While the carrier has some mechanisms in place to mitigate its expenses denominated in the USD, markets are spooked and the carrier’s stock price has fallen since it warned that it would face challenges in the first three months of 2014. Aside from the weaker 4Q2013 results, Air Canada recorded a return on invested capital (ROIC) for 2013 of 11% versus 7.9% the year prior. 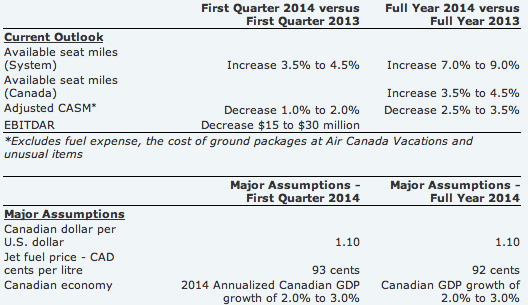 Its return performance bodes well for Air Canada’s stated goal of reaching a sustainable ROIC of 10% to 13% by 2015. While Air Canada remains bullish that it is on a well-established path towards sustainable profitability, it faces some immediate noise that could create a cloud over its business transformation. But despite the near-term challenges, its cost reduction efforts appear to be paying off as it forecasts unit costs reductions for FY2014, compared with projected increases at its main rival WestJet. Air Canada recorded CAD10 million (USD9.1 million) in profits for FY2013, reversing a loss of CAD136 million (USD124 million) the year prior. Its 4Q2013 losses shrank from CAD60 million (USD55 million) to CAD6 million (USD5.4 million) year-on-year. During 4Q2013 the company’s top-line operating expenses decreased CAD33 million (USD30 million) to CAD2.7 billion (USD2.5 billion), which helped lift operating income year-on-year from CAD47 million (USD43 million) to CAD135 million (USD123 million). Operating revenues during 4Q2013 grew from CAD2.8 billion (USD2.5 billion) to CAD2.9 billion (USD2.6 billion) year-on-year. For FY2013 Air Canada’s top-line expenses notched up 1% to CAD11.8 billion (USD10.8 billion), but revenues increased CAD268 million (USD244 million) to CAD12.4 billion, (USD11.3 billion) which resulted in a rise of its operating income from CAD442 million (USD403 million) to CAD619 million (USD564 million) year-on-year. The carrier also recorded an improvement in its US transborder operations, which during the last couple of years have been pressured by competitive capacity increases and aggressive pricing by its competitors. Air Canada cited yield growth on US long-haul routes to Florida and Hawaii; but noted some of those gains were offset by continuing increased capacity and aggressive pricing on short-haul transborder markets including Boston, New York and Washington, DC. Air Canada’s domestic yields decreased 0.8% for FY2013. The carrier explained it recorded decreases in yields on all its major domestic routes, with the exception of long-haul transcontinental routes linking Toronto, Montreal and Ottawa with major Western Canadian cities and on routes within Western Canada. Yields in Air Canada’s Pacific markets dropped 1% year-on-year during FY2013, as increased industry capacity and the weak Japanese yen pressured its performance in the region. A weaker economy in Australia also contributed to Air Canada’s weak Pacific results for 2013 along with capacity pressure and a higher proportion of lower-yielding traffic on service to Korea. During 4Q2013 Air Canada recorded a system 0.6% drop in yields as unit revenues declined 1.7%. Its domestic yields fell 3.6% year-on-year and Pacific yields plummeted 4%. Yields fell on all of its major domestic services, said Air Canada, driven by increased industry capacity and pricing pressure. Many of the same issues that contributed to Air Canada’s weak Pacific performance for FY2013 pressured its 4Q2013 performance along with increased industry capacity on service and a higher percentage of lower yielding traffic on service to Hong Kong and China. Air Canada’s yields in transborder markets jumped 4% year-on-year during 4Q2013, driven by higher-yielding traffic in its economy class. It recorded yield growth on all of its major US transborder services despite a higher level on long-haul flights compared with the year prior. Yields grew 0.7% in Air Canada’s trans-Atlantic markets in 4Q2013, also driven by higher-yielding passengers it is economy class, the airline said. Air Canada has refined its capacity growth for full-year 2014 from 9% to 11% to 7% to 9%, driven mainly by its decision not to introduce additional service between Toronto and Beijing due to unfavourable slot times the carrier received in Beijing. Carrier CEO Calin Rovinescu remarked that Air Canada would not operate long-haul operations if it couldn’t generate favourable connections. Even as the carrier works to attain more optimal landing slot times, Mr Rovinescu stressed that moderating Pacific capacity was not a bad decision. Air Canada estimated that industry capacity to China increased 28% year-on-year during 4Q2013. Air Canada’s main domestic rival WestJet has revised its unit cost guidance excluding fuel upwards for FY2014 from flat to 1% growth to an increase of 1.5% to 2.5% driven in large part by the weakening CAD against the USD. But even as Air Canada faces the same foreign exchange challenges, it estimates a unit cost reduction of 2.5% to 3.5% for FY2014. The carrier explained it has consistently focused on cost reduction, and is recording decreases in all areas with the exception of maintenance. Air Canada also expects that its new low-cost carrier rouge will make a meaningful contribution to the carrier’s unit cost reduction in 2014, said Mr Rovinescu, along with the full-year benefit of the operation of higher-density, 450-seat Boeing 777-300ERs introduced during the latter half of 2013. As six Boeing 787-8s are delivered to Air Canada during 2014, four mainline 767s are being transitioned to Rouge and nine mainline Airbus narrowbodies move to Air Canada’s low-cost entity. 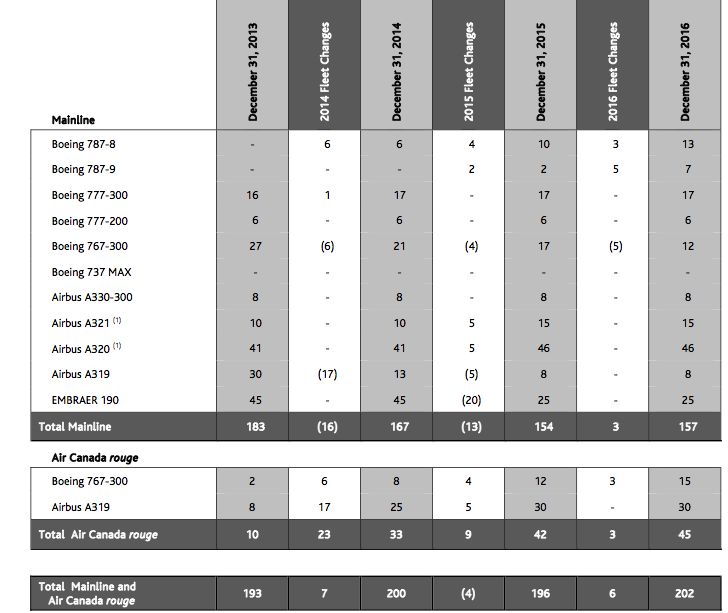 Previously, Air Canada has estimated a 21% unit cost reduction through Rouge’s operations of A319s versus mainline and a 29% decrease in the 767s transferred to the low-cost carrier. Weather disruptions in Dec-2013 negatively affected Air Canada’s 4Q2013 results by approximately CAD15 million (USD13.7 million), and the carrier expects its 1Q2014 EBITAR to fall CAD15 million (USD13.7 million) to CAD30 million (USD27.3 million) below 1Q2013 due to continuing operational disruptions from winter weather and currency headwinds. For FY2013, the weaker CAD increased operating expenses by CAD147 million (USD133.7 million), partially offset by a favourable currency impact on its revenues and currency derivative gains of CAD55 million (USD51 million). During 4Q2013 the hit on Air Canada’s operating expenses from a weaker CAD was CAD75 million (USD68 million), again, partially offset by a CAD24 million (USD22 million) gain in passenger revenues and CAD13 million in derivative gains. Overall it seems the foreign exchange challenges are a mixed bag for Air Canada since the weakening CAD pressures its expenses but generates some favourable income and revenue gains. Expenses Air Canada incurs in USD include fuel, aircraft rent, maintenance, interest payments on debt and aircraft purchases. The carrier estimates cash inflows of CAD1 billion (USD910 million) and CAD outflows of 4.5 billion (USD4.1 billion) during 2014. To manage the shortfall Air Canada aims to convert excess revenue from other regions to the USD, tap its US cash reserves and use fixed rate derivatives to purchase USD at a rate of USD1.03. Air Canada estimates it has hedged roughly 53% of its USD cash outflow in 2014. The hedges along with Air Canada’s estimates that every one cent increase of the CAD against the USD results in CAD34 million (USD31 million) in favourable impact to its operating income should provide some shield against currency fluctuations. Its diversified network and strong focus on international markets during 2014 should also help alleviate some of the currency drag. Weather and currency fluctuations have created a shadow over Air Canada’s YE2013 results and continue to create some market jitters at the present moment. However, it has faced much worse challenges in the recent past, and has learned that only fundamental business changes will allow it to weather the inevitable external shocks inherent in the airline business. While it is too early to determine how much foreign exchange obstacles will affect its performance in 2014, Air Canada does have protections in place to stave off some of the effects. It is likely in a few weeks time the market may just have other issues to be nervous about. Airlines are rightfully focussed on return for the long term rather than irrational market behaviour.